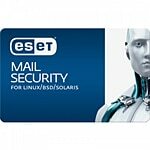 ESET Mail Security for Linux/BSD/Solaris, version 4 offers lightweight yet powerful protection for heavy-duty mail servers based on the Unix platform. This product features ThreatSense, the industry's most accurate proactive technology for detecting all types of malware. ESET Mail Security delivers both on-demand and on-access real-time protection from known and unknown viruses, worms, trojans, spyware and other internet threats. Included spam filter offers multiple, simultaneous filtering methods to provide effective detection and excellent protection. Version 4 also expands mail security coverage to include support for Novell GroupWise collaboration software, making it even easier for IT administrators to protect all Unix based mail services with one single product.